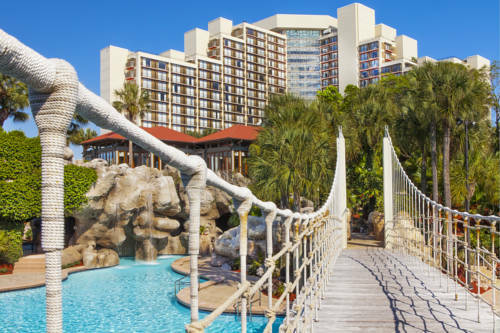 A resort oasis at Downtown Disney near Seaworld and Universal with a half-acre lagoon-style pool, slides, water sports and beach. 815 room luxury hotel offers 4 restaurants, 4 lounges, 45 holes of Jack Nicklaus designed golf, Tennis and Racquet club, nine-hole pitch and putt golf course, volleyball, basketball, a 1/2-acre free- form swimming pool, 12 waterfalls,3 whirlpools, 2 water slides, swinging rope bridge, 21 acre Lake Windsong, non-motorized water sports, 1,000 feet of white sand beach,health club, 24 foot rock climbing wall and children's facilities. MUST CXL BY 4PM EST 72 HOURS PRIOR TO ARRIVAL. Serving island fare in a Key West atmosphere. The restaurant is perched on a natural rock formation in the center of the swimming pool. Restaurant hours are seasonal. Please call for exact hours.